In winter, North America's Arctic tundra appears to be a vast and desolate blanket of snow and ice. Appearances deceive. Your eyes wouldn't spot a speck of green anywhere. But despite the frigid temperatures, an unlimited quantity of nutritious lichens and moss thrives just a few inches beneath the landscape's frozen crust. Think of it as a salad buffet served up by Mother Nature especially for the vegetarian creatures -- herbivores -- that live on the frozen plain. 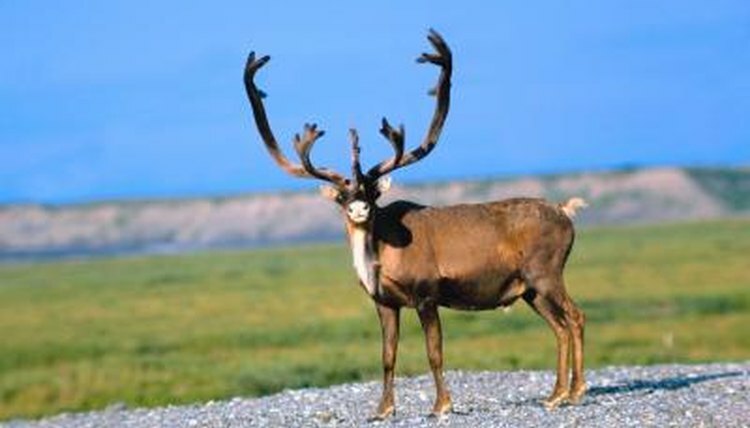 Large relatives of the deer, caribous are iconic of Alaska and Canada's far north and are the same species as the reindeer of Scandinavia, Greenland and Russia. Every year in North America, vast herds consisting of 50,000 to 500,000 animals travel hundreds of miles between spring calving grounds on the tundra to wintering grounds in boreal forests. Female caribous, unlike female deer, have antlers, though they're not as massive as the males'. Similarly, bull caribous, which can weigh as little as 275 pounds and more than 600 pounds, are much larger than cows, which average 200 to 300 pounds. The musk ox resembles a bison but is more closely related to goats. It gets its name from the strong, musky odor emitted by males to attract mates. Its coat consists of a shaggy outer layer and a downy winter undercoat shed in blanket-size chunks every spring. Called qiviut, this fur is collected by people who follow the herds. Warmer and more finely textured than wool, yarn made from qiviut is comparable to cashmere; it can be knitted or woven in the same way. On average, musk oxen range from 6 feet to 7.5 feet long, measure 4 to 5 feet at the shoulder and weigh 400 to 900 pounds. In winter, the Arctic hare's thick fur is almost blindingly white, providing excellent camouflage against the ice and snow covering the tundra, Its black eyelashes act like sunglasses to shield the animal's eyes from glare. Since it doesn't hibernate, its roly-poly body shape and relatively short ears help it conserve heat. On average, this hare weighs 6.5 pounds to 11 pounds. With its long hind legs and snowshoelike back feet, the Arctic hare can clear up to 7 feet in a single bound and run at speeds of 40 miles per hour -- without sinking into the snow. The indigenous people of the north hunt the Arctic hare for its meat and fur. Pity the poor lemming, the tundra's smallest mammal and a favorite snack for almost every predator in the Arctic. Because this mouselike rodent weighing 2 ounces to 4 ounces is part of the staple diet of so many animals, changes in population can have serious repercussions. For unknown reasons, in four-year-cycles, lemming numbers fluctuate wildly between extremes, peaking to vast overpopulation before crashing to semi-extinction levels. The story that lemmings commit suicide en masse by running off cliffs isn't true; but in peak years, they are often seen in swarms on land and sea ice. Their colors vary during summer. In winter, their coats turn white, and they live in burrows under the snow. University of Alaska Fairbanks: Large Animal Research Station: What Is Qiviut?